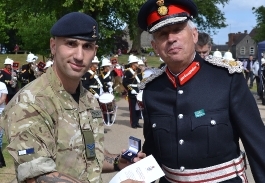 The Lord-Lieutenant may be called upon to carry out a variety of duties connected with the Armed Forces. For example he may be commanded by The Queen to present colours. He may be invited by the Commander concerned to inspect troops on parade including taking the salute on arrival or during a march past; to inspect guards of honour; to attend funerals of servicemen killed abroad; to receive units on their return from overseas; to present campaign medals; and to take part in other ceremonial functions. 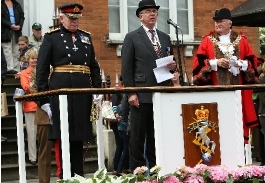 The Lord-Lieutenant has a close working relationship with the South East Reserve Forces’ and Cadets’ Association and is President of the County Association. Each year the Lord-Lieutenant appoints 4 senior cadets as Lord-Lieutenant’s Cadets – one each from the Army Cadet Force, the Sea Cadet Corps and the Air Training Corps and one from the Combined Cadet Force. These cadets support the Lord-Lieutenant in his work during their year of office, accompanying him to royal visits, awards ceremonies, and similar official events. 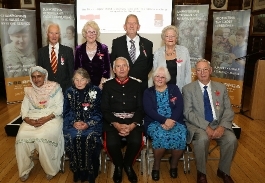 Each year Lord-Lieutenant’s Certificates are presented to members of the Reserve Forces for meritorious service. There is a special annual County presentation ceremony at which the Lord-Lieutenant’s Cadets are invested and the Lord-Lieutenant’s Certificates are presented.